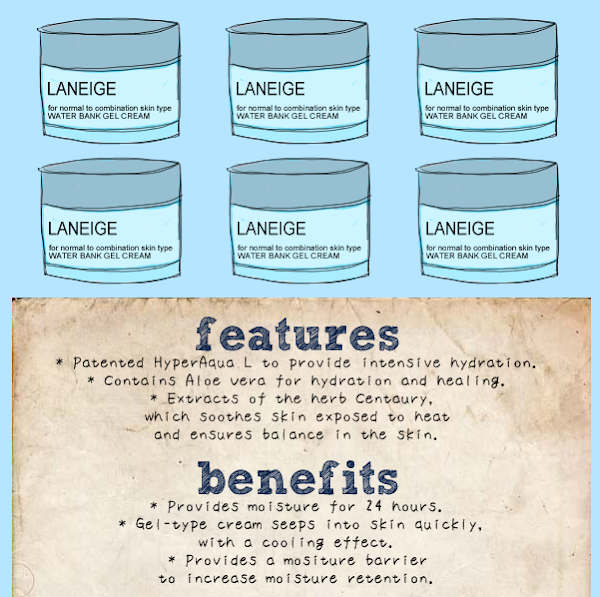 Here's the second installment of the Laneíge's Essential Care Trial Set_Light to chase away any remaining Monday blues! The Laneíge Water Bank Essence, made for all skin types, contains mineral water to regenerate the skin, the Water Pump System to protect the skin's moisture and at the same time, seal the moisture in so that the skin is hydrated all day long. 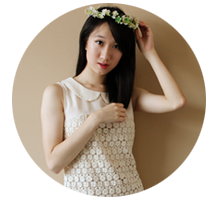 It dampens the skin immediately upon application and so, forms a natural moisture barrier. Chestnut and seaweed extracts enhance keratin turnover to ensure that the skin's healthy, smooth and energized! Housed in a 30ml bottle, the translucent essence has a light and clean scent. Hygiene is once again taken care of, because all that is needed to be done is to press on the nozzle lightly. The nozzle allows just the right amount of essence to be dispensed easily. I use this after the emulsion and spread it outwards, from the centre of my face. The essence is light and when spread out, it kind of transforms into a water-like substance (A little thicker.). It is quickly absorbed into the skin, leaving a comfortable and thin, albeit a tad waxy, layer on the skin. 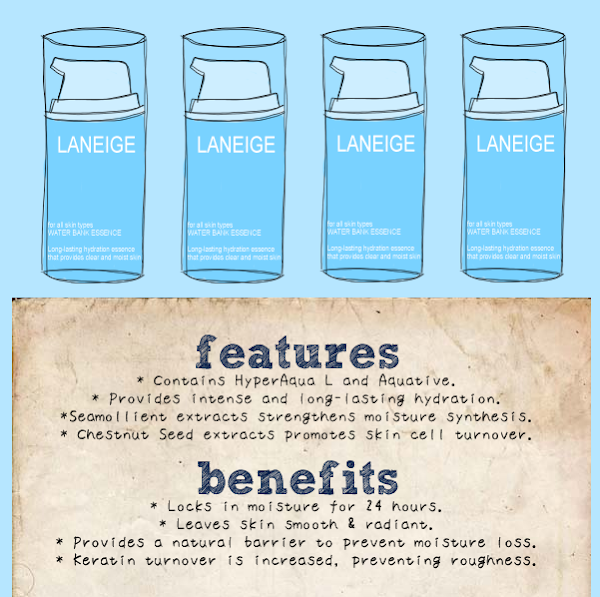 The Laneíge Water Bank Gel Cream is for normal to combination skin types. This gel-type moisture cream provides 24 hours worth of moisture to the skin, minus the stickiness! It penetrates into the skin quickly with a cooling effect, which is perfect for right-before-bedtime! Centaury extracts soothe the skin and protect it from the harmful weather elements. Aloe extracts form a protective barrier to seal in moisture in the skin. The 20ml tub of gel cream is the final step to ensure your skin's all glowing like Song Hye-kyo. I have an issue with the packaging because this requires the dipping of fingers into the product. :\ BUT I have absolutely no complaints about the product whatsoever. I apply this right after the essence, and just like the other products, apply it in the outwards direction. 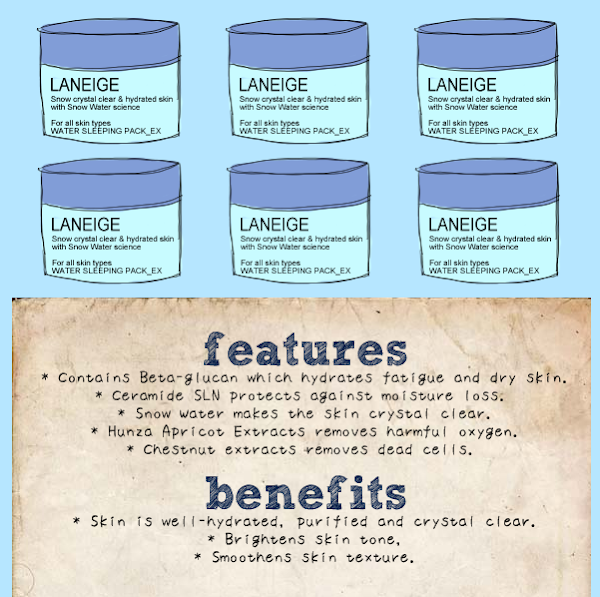 The Laneíge Sleeping Pack_Ex is Laneíge's star product and is made for all skin types. This sleeping pack has a light gel-type texture that provides intensive hydration and 'illuminates' the skin. As it works its magic on your face, its aromatic scent ensures that your journey to lala land has zero hiccups. Just a little more about the aromatic scent... It's called Sleepscent and it's a wonderful concoction of essential oils from Orange Flower, Rose, Ylang Ylang, Sandal Wood and others. Laneíge believes that a good sleep translates into skin that's healthy and glowing and so Sleepscent is added to relax your mind and body and make certain that you sleep to the fullest! The packing of this 20ml tub of magic, again, does not sit well with me. I really do not like dipping my fingers into products. But onto the more important stuff... Laneíge provides a set of instructions for you to follow (Read it here.) so that you get the most out of the sleeping pack. The instructions are easy and they are what I do, before applying the sleeping pack on my face. And gosh! I get why my cousin, hairdresser and many other beauty junkies on the net rave so much about this! I wake up to skin that's velvety soft!!! I have never woken up to such skin before and I was pleasantly surprised!!! I'm a big believer of essential oils too, so I appreciate the addition of Sleepscent (I slept like a baby but it could also be because I'm on my hols. Nevertheless, I think Sleepscent did help.). This is one sleeping pack that's going to take up permanent residence in my loo!!! Truthfully, my skin's nowhere close to that of Song Hye-kyo's but that's also because genetic, climate and stress (Both physical and emotional.) play a part in the skin's condition. But I'm excited about what Laneíge can do for me at the end of my journey! I would, however, suggest using this as your night skincare regime as I find it a little too heavy for the day (Even with the Light set meant for oily skin types. ), what with the blazing sun and Singapore's insane humidity.